Situated in the beautiful North York Moors, between Whitby and Scarborough, The Falcon Inn features a restaurant and a bar. With free onsite parking, the family-run pub has free Wi-Fi in public areas. Within the converted stone stables, the contemporary rooms include a flat-screen TV with a DVD player and tea and coffee making facilities. Each room benefits from an en-suite bathroom with complimentary toiletries. Guests can enjoy hearty and wholesome British cuisine in The Falcon Inn. The menu includes classic fish and chips and steak pie. Dishes are prepared using seasonal and local produce. 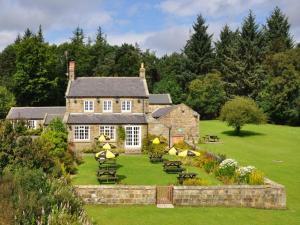 Drinks are available in the country inn, which boasts a log fire and cask ales. Overlooking the coastline, The Falcon Inn is nestled near the end of the Lyke Wake Walk. Guests can also explore the Falcon Flyer Challenge Walk, the Cleveland Way, and the Coast-to-Coast route.